Due to the sensitive of the proposed development a contaminated land planning condition was attached to the decision notice for the proposed development. A factual environmental data report was submitted in July 2016 to discharge the contaminated land planning condition, which was rejected by the local authority as the document was no a Desk Study report. Demeter Environmental were commissioned to prepare a desk study report to comply with the requirements of the local authority. The review of the historical O.S. maps revealed that the site was used as an orchard prior to the erection of the public house circa 1892, aerial plates conformed the buildings were present up to 2015. Streetview images indicated the site was cleared between August 2015 and July 2016. 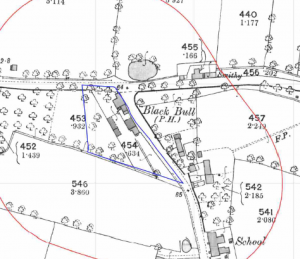 The O.S maps revealed two in-filled ponds and a smithy in close proximity to the site. Environmental data in the Groundsure reports and data provided by the Environment Agency did no reveal any further potential sources of contamination, and the data indicted the controlled waters in the vicinity of the site were of low sensitivity. The site walkover survey was undertaken on completion of the review of the O.S maps and environmental data, at the time of the walkover survey the site had been cleared and the building had commenced. As the site had been cleared it could be demonstrated that made ground associated with the previous site uses had been removed from the site. The remainder of the potential sources of contamination (former buildings, smithy, orchard and in-filled ponds) were assessed in the qualitative risk assessment and it was concluded that none were credible sources of contamination. As there where no credible sources of contamination, a conceptual model for the site could no be constructed, demonstrating that no further works were required. The decision notice accepting the desk study report is here.